Eric Millegan (born August 25, 1974) is an American actor, best known for his role as Dr. Zack Addy on the Fox series Bones. Millegan was born in Hackettstown, New Jersey, and raised in Springfield, Oregon. Eric attended high school at Springfield High School, where he was student body Vice President his senior year. He studied acting at the Interlochen Arts Camp at Interlochen Center for the Arts before studying musical theatre at the University of Michigan and receiving a Bachelor of Fine Arts degree. Millegan is openly gay. Out magazine named him the "Hottest Up-and-Coming Openly Gay Actor of 2003." In March 2010, Millegan came out as having bipolar disorder in The Huffington Post. Millegan married his long-time partner, Charles Michel, in New York City on June 28, 2012. He announced his union on Twitter. On November 1, 2015, Millegan ran in the TCS New York City Marathon. 2001 100 Centre Street Michael Truskie Episode: "Love Stories"
2002 Law & Order: Criminal Intent Eddie Dutton Episode: "The Insider"
2004 Curb Your Enthusiasm Delivery boy Episode: "Opening Night"
^ "Interview With Eric Millegan". AfterElton.com. 2007-02-27. Archived from the original on 2011-08-16. Retrieved 2013-02-18. ^ "Eric Millegan on Living (and Acting) with Bipolar Disorder: Part 1". The Huffington Post. 2010-03-18. Retrieved 2017-01-27. ^ Eric Millegan (2012-06-28). "I'm "married"". Twitter. Retrieved 2014-07-07. 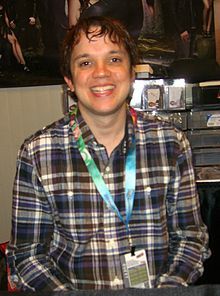 Wikimedia Commons has media related to Eric Millegan.